For companies who lack brand positioning BR&More designed a tool to help companies get a better understanding of how important it is to let their view match with their customer’s view. The consultants of BR&More are capable to analyze the occurring situation with a designer’s eye. This entails working with typical designer tools like for example visualizations, co-creation, knowledge brokering and networking between different stakeholders. This helps clients with expanding their decision-making methods. By working with us the working force within the company gets trained to not only rely on rational decision-making, but also use the intuitive decision-making approach (Calabretta,2014). Combining these two methods ensures that the process can be ran through faster, but still with enough depth. The greatest benefit will be that visions for the future will be made tangible, which will make it more reliable to rely on imagination. The designer’s eye forms one of the core values of BR&More and makes our approach different from other branding companies and therefore is even a better fit for emerging markets. This category of companies currently doesn’t see the benefit of working on the development of their brand or lacks vision todo so. With the mentioned design capabilities of the BR&More employees, consulting will be tailored to the needs of our clients. Our customers are currently cost driven as a consequence of the market that their working in. The design capabilities contribute to making consulting cost effective. Exploring the fundamental needs ensures that the essential problems and cost cutting solutions can be found be found in a more efficient manner. Using a user-centred approach helps our client to get a better understanding of the needs and values. This can be translated into a persona: a fictitious character that embodies the people from (a) customer segment(s). By making a coherent whole of the view provided by both sides – customers and client- BR&Mor ensures that the clients can better reach its customers by fulfilling the customer’s demands with an image that coheres with the perception of the company. Synchronizing the mental model of both parties (Smulders, Lousberg & Dorst, 2008) is one of the key values of what BR&More can offer. BR&More uses dynamic tangibility to guide its clients in making its thought visible. By using low-risk prototyping the clients wishes (working cost effectively within a budget) can be satisfied. BR&More focuses on the developing markets in China and India to offer valuable consulting services. 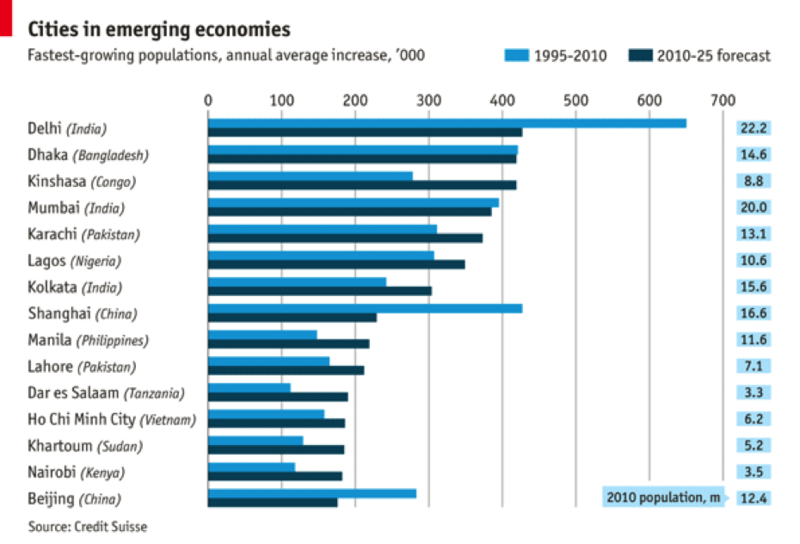 As fast-growing countries in recent years, China and India have enormous marke ts because of the great economic boom and the fast growing population (Cities in emerging markets). A lot of companies in these two countries that are focused on designing and producing good products fail to create high brand awareness or find the right target customers due to a lack of appropriate brand strategy. BR&More is convinced that when these companies get offered professional knowledge of branding and employ it into their business, they will have huge possibilities to push retails sales and image in the local markets or even the international markets. Given the fact that most of the large companies already have their own departments for branding or cooperate with design consultancies to building a brand strategy, BR&More narrows down its focus to small and medium companies that currently sell their products locally in Chinese and Indian markets. 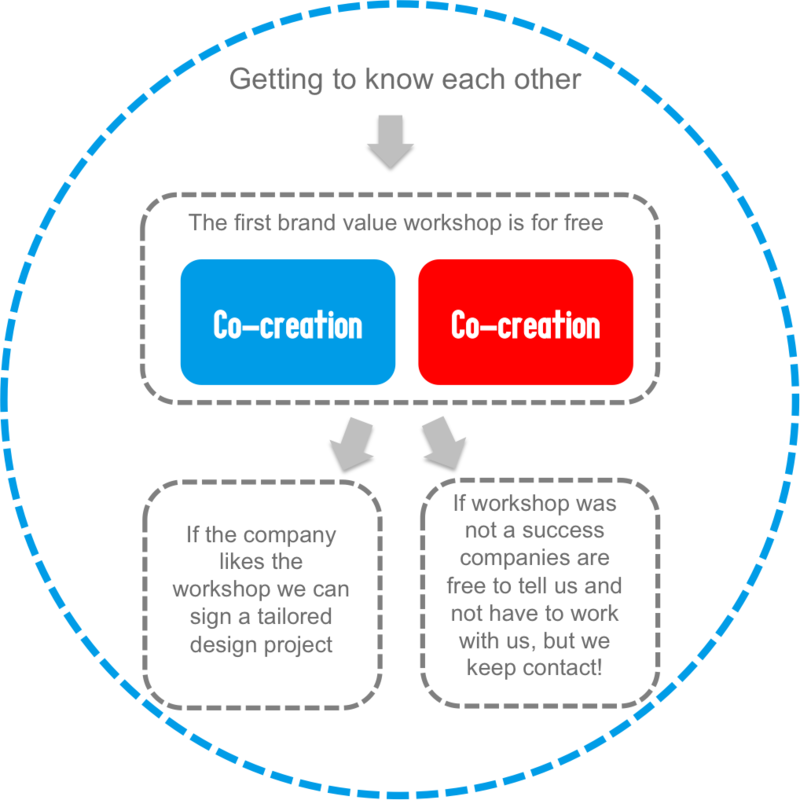 The BR&More-brand-value-creating-method is meant for the companies to make companies aware and give them insight in lack of coherence in views of the customer and the company itself. The method exists of three building blocks (brand positioning, brand identity and brand in action), in which a combination of different tools are used. A profile of the client will be formed based on the intake interview that BR& More. During this interview BR&More will also determine what kind of customer fits with the company’s description. The intake meeting we as BR& More strives to get a preliminary vision of which building blocks of the focus will probably lie. Based on this information we invite these customers to take part in first workshop and determine which further specific knowledge needs to be gained from this experience. The start-up session, a co-creation session with the client and the customers, is the only moment that both client and customer will get confronted with the method and run through all building blocks. The consultants of BR&More will guide this session. At the end of the co-creation session BR&More advices the client when it comes to which building block to focus on. However, client is king so in the end it’s up to them to make the final decision about this aspect. This method is particularly suitable to use when a company in BR&More’s targeted group has a good product portfolio but lacks an appropriate brand strategy. The method will be introduced to the company to build brand positioning and value and pursue the use of brand driven innovation. Especially companies in emerging markets don’t see the value of branding while they could make a big profit out of it. In short, BR&More targets the companies in China and India because of the economic boom and growing markets. The first block is the starting point of the whole method: refining or creating brand values as the basis of the company’s brand strategy. The brand value is made up of a company’s culture and its core values. This supports the coherency within the company and functions as a sort of brand DNA; something every employee has embedded in his being as an employee (Junginger, 2008). Based on this BR&More can help the company build its mission and vision for better brand-driven innovation in future. Finally, BR&More continue to employ design thinking and professional skills to help the company design their touch points, which is the third building block of the whole method.In order to provide complete service to the customers, the touch points design should cover the pre-purchase, purchase, and post-purchase stages consecutively and logically. By using the blueprint for product service systems (Morelli, 2006) and mapping the customer journey BR&More can clarify were the bottlenecks of whole system are and thus what should be redesigned. The method can be used to evaluate the perception that the users have of the brand and to see if it aligns with the how the brand wishes to be perceived. This step is taking to synchronize the mental model of the opposing parties (Smulders, Lousberg & Dorst, 2008). Once this is done the method is not only a checklist but also a step-by-step guide of tools that can be used to build a complete brand image that is coherent with the companies products and services and their target audience. Being a startup in emergent markets who are extremely cost driven, we provide our first workshop with the company for free. This will make them more willing to take part in various workshops that we offer and at least they would be open hear what we have to say. Using the customer’s perspective we can prove that the company needs us to communicate its brand in the right manner to the target customer. In this way, we will gain a client and also involve him in the process of working on the development of one or more building blocks. If the customer however does not see value in this he is free to part ways with us. This business model will only be followed in the initial stages until we get substantial work experience and success stories to prove our worth to the companies in the emerging markets. The users are given the map and in a focus group session they analyse the brand and what they think about it. This same tool is used to see how the company wishes that their brand is perceived. The company is then shown where it lacks and where the two perceptions do not align. This tool is then used as a path to build a coherent brand strategy. With the user centered approach used in this step BR& More can show its customer that there is a gap between how they think they are perceived and how they are actually perceived. With this information the companie s can choose to align their innovation strategy, with their brand image (Beverland, Napoli & Farrelly, 2010), so their customers don’t get confused about what the brand entails. Furthermore the employees will play a crucial role as they are the one working in the company and able share their opinion on what the company is and should be about. The user centered tools that will be used within this building block are ethnographic research and observations. This is a typical tool that can be used by designers and it is essential to give the companies in these emerging markets insight into branding so they can enhance their brand image and benefit from the growth potential that they have. By collecting deep data on others BR&More can help the company reduce their cognitive biases. The company doesn’t have to rely on its own assumptions anymore. With the ethnographic and the observation tool the category 1 (projection, egocentric, empathy, focusing and hot/cold gap) and a small portion of the category 2 bias (say/do) gap is diminished (Liedtka, 2014). In the views of both employees, management and customers will be combined were possible and core values will be formed. The tangible outcome of this building block is the company manifest in which the vision and mission is are described. This serves as support for the company, which can be used at all times to ensure the core is not lost. and the management of the company on the other side. This will ensures that the perceptions of both parties are synchronized. Subsequently, a thorough business analysis is done and the findings are presented with visualization tools. Using the visualization tool helps the company because the perspectives for the future are made tangible through drawings. Hence, decision-making of the actors is no longer dependent on rational thinking, but can also be based on intuition (Calabretta, 2014). The brand identity will be even more tangible than the company manifest, since in the latter one there will only be clarified what the brand DNA of the company is and what the values of the company are. The brand identity will for the theme in which the company will physically present itself on for example its website. In a parallel process, the cross channel proposition will be formed. This aspect will be focussed on the experience that the customers have when they use the different touch points (products & services) of the brand. The current touchpoint will be evaluated together with the customers. If there seems to be a mismatch prototyping will be done on the spot. After the session the company will get a touch point maps in which a review of the desired user perspective is included. The last step of the process concerns bringing the strategy in action. BR&More will step in and help the company with redesign their current touch points (products and services) so it will appeal to their customers. During this step the company will get taught how to use design thinking (Brown, 2008) to redesign their touch points and how to apply design thinking in future projects so they can reach their full potential. In this building block the focus is on strategy in action. In this part of the phase the company will strengthen their touch points by actual concept development either with the computer or with bare hands. The outcome of this part of the method can be a new or redesigned website/app, packaging, commercial campaign and/or shop or shelve space. We as BR& More are there to help the company see what should be changed in the touch points they are using right now. Although we make the plan for the new or redesigned touch points we do not change or make the those touchpoint ourselves. We will help the company to get in contact with people who have the expertise to do this for them. To explain the process of using the BR&More brand value creating method a real company in India is reviewed. Mitticool Clay Creation is an Indian company focuded on designing and selling clay products for daily usage, especially kitchen utensils. Unlike most of the clay products in the current market, Mitticool has a portfolio that is not only aesthetic and sustainable minded, but also very functional and innovative. The company is featured by the clay water filter which can clean water naturally and keep water cool, the clay refrigerator which preserves the original taste of fruits and vegetables, and other products including a clay cooker, a food plate, a non-stick coated tawa and a clay diva. Mansukhbhai Prajapati – the founder of the company says- his aim is to provide luxurious things to countrywide people who cannot imagine affording electronic goods. Concequently currently all the Mitticool products are mainly sold in rural areas of India with a low price. When it comes to innovation in the future, the company has also developing the idea to design a self-cooling house which would not require electricity connection for any purpose. There is no denying that the company has somehow built a high awareness by smart innovation and high quality in their targeted group, but still the “luxurious” products deserves more people’s attention. A refinement of Mitticool’s brand value and an extension of its customer segments is demanded to achieve this goal (www. mitticool.in). Step 1 takes place after collecting reflections from both sides. We compare the results and figure out the agreements, similarities, disagreements and conflicts to get a coherent direction. Then we show what Mitticool lacks and try to align the company’s strategy to the customers and finalize the strategic position. The position will be elaborated as a brand story in detail. The story will consist of key messages including why Mitticool make these innovations, how they make these innovations, and what products they design for the innovations. For better instruction, this story will be written in a coherent company manifest for the Mitticool employees. both sides to create the brand identity and cross channel proposition. The brand identity will be buil t based on positioning statement, company persona and visual ID. The persona is more like a symbol of Mitticool which will be introduced to its clients and customers. The brand identity is a integration of the brand tone, brand dialect and brand voice which can be written as guidelines and spoken to people, and visualized design strategy including design style, color schemes and visual id employed in Mitticool products, websites, printed matters and so on. This can support the company to stick to a coherent brand strategy to reach their customers. Also we will help Miticool to do a thorough business analysis and present our findings in visual for future guideline. To make the cross channel proposition, we try t o make full advantage of customers’ insights into Mitticool products and their everyday experience to refine the user experience as much as possible. Then we complete a touchpoint & experience map to help Mitticool designers generate concepts. Last but not least step 3, BR&More moves to branding in action. This part mainly aims at using concept development and various design methods to make better commercialization. Besides the designers’ ideas, we encourage the customers to give us more evaluations and inspirations of the design of Mitticool products, website, application, package, shop, shelf, commercial campaign, logo and so on. In addition, we help Mitticool to redesign its products and services, and teach the employees of Mitticool to use design thinking in their future projects. In the whole three-step process we mentioned above, we keep using our tool to get perceptions from Mitticool people and their customers to make alignment for coherency. 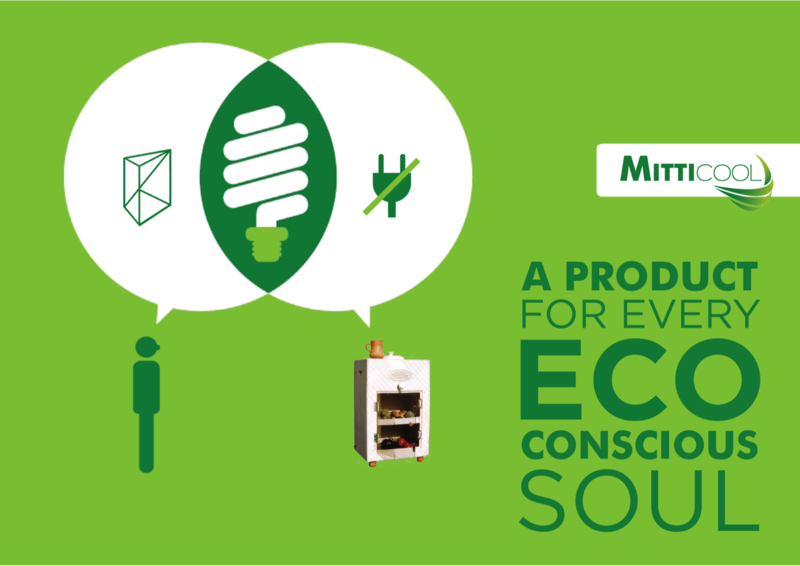 An ideal goal is that finally Mitticool can change its brand image from the cheap, coarse, traditional one into a fresh, elegant, sustainable, eco-friendly, innovative one, and increase its brand awareness among the well-educated urban people. Mitticool’s new communication tool to help better branding its products to current and potential customers. 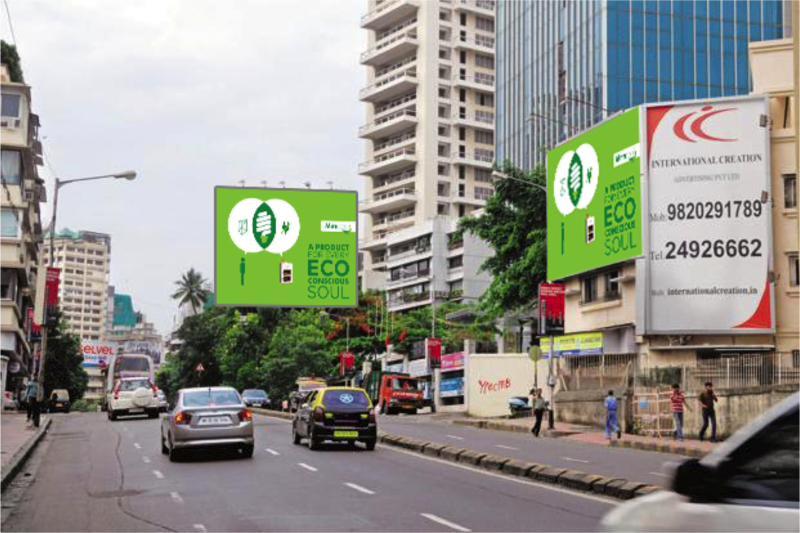 Implementation of the new poster for Mitticool on the streets in India. Beverland, M. B., & Farrelly, F. J. (2011). Designers and Marketers: Toward a Shared Understanding. Design Management Review, 22(3), 62-70. ­Junginger, S. (2008). Product development as a vehicle for organizational change. Design Issues, 24(1), 26-35. Morelli, N. (2006). Developing new product service systems (PSS): methodologies and operational tools. Journal of Cleaner Production, 14(17), 1495-1501. Smulders, F., Lousberg, L., & Dorst, K. (2008). Towards different communication in collaborative design. International Journal of Managing Projects in Business, 1(3), 352-367.